We’re pleased to reveal that our recent construction work is now complete. We now have a new entrance, driveway and parking bays, completing a full refurbishment that began last year. Following resurfacing work that took place during September, we’ve now concluded the final stage of the site’s development. The 6,000 square meter resurfacing project was carried out by Pheonix Surfacing, an independent surface contractor based in Kettering. During the redevelopment, it was decided early on not to spoil the character of the Victorian site. “We’re very proud of our site’s history and we are always keen to make improvements whilst keeping the original quirks and charm of the buildings,” explains Gail. 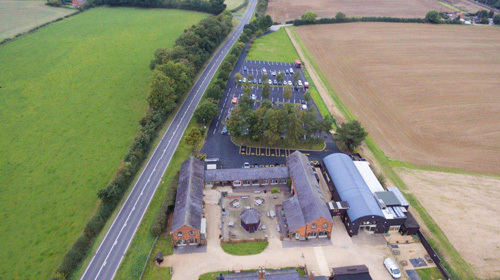 Our Northamptonshire shopping village is built on a former Victorian farm, with many of the shops housed in what were once barns and stables. The farm was purchased by the Brodie family in the early 1900s and remained in the family for many decades before the site was converted to its current usage. The recent redevelopments are the first since it opened as a shopping village. Come in and see what we’ve done! Our shops cover a range of specialities including art, furniture, clothing, health and beauty. So whatever it is you’re looking for, you’re likely to find it here at Heart of the Shires. To keep up with the latest news and updates from all of our shops, you can sign up to our monthly newsletter or follow the Heart of the Shires on Facebook and Twitter.